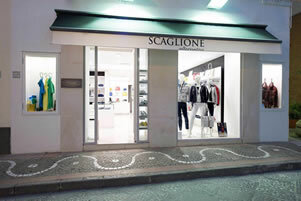 Located on Corso Vittoria Colonna, on the corner of a famed meeting place –“Il Giardino degli Aranci” - the original store "Scaglione-Alternative" is trendy and attracts a younger and fashionable audience. Characteristic of the informal world, the store, specialized in casual fashion, looks like always different both in collections and in layout exhibition. Also the staff of the store, strictly young, is the pioneer and the sponsor of the trendy style that the shop wants to transmit.